I touched one for the first time last Saturday. My hand trembled as I stroked her. I had waited a long time for this moment. You must understand that throughout my boyhood I had only ever seen one in the centre-fold of a magazine. But no glossy picture in an 80’s magazine could have prepared me for her beauty, in the flesh. She was, she is, gorgeous! You’ve guessed it. 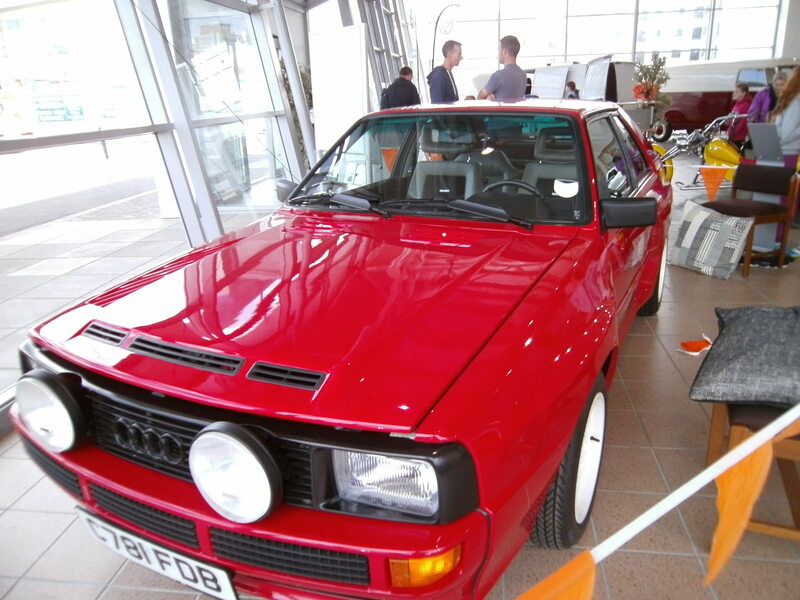 I am talking about the ‘Audi Sport Quattro – short wheel base’. The daddy of d’Audi. God’s gift to car enthusiasts. Only 214 were ever made. 175 were sold to the public. The rest were converted to rally cars or used for test purposes. 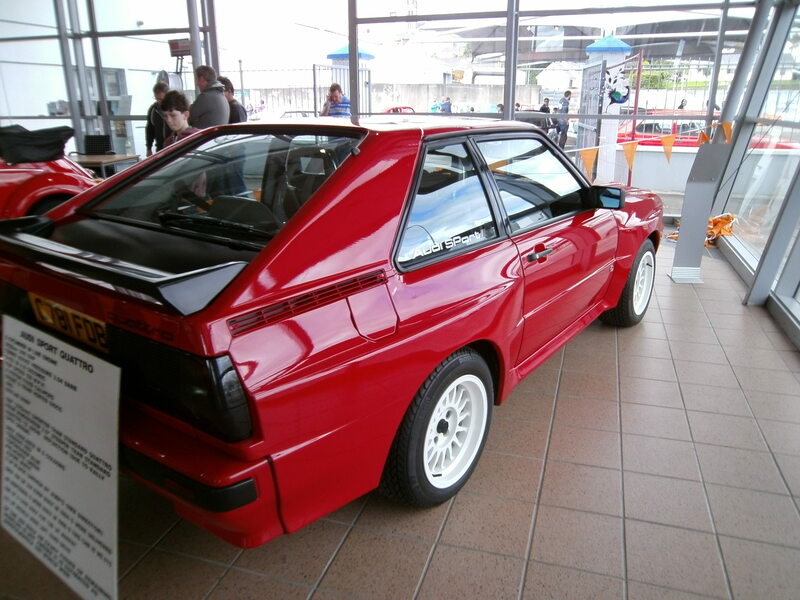 Audi already had the longer wheel base Quattro in production for a few years and these were also very successful in rally format. But zee german auto company vanted to build zee ‘ultimate’ rally car. The rally rules stated that a car had to have a production run of at least 200 vehicles before it could be used for competition. Hence the 214. I will leave it that. I am a bit of an anorak on 80’s Audi and VW cars. I have owned lots of those brands in years gone by. 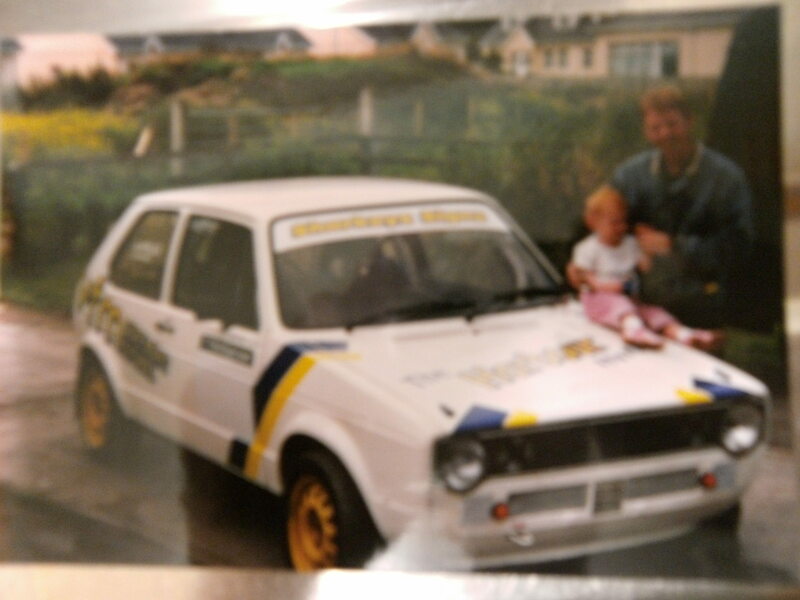 I even went though a period of rally driving also. She was a little Mk 1 golf. Good memories. Back when I had some money. Back before the children needed trivial things like…I don’t know…shoes and food. Hello children, goodbye rally car. So anyway last Saturday I came face to face with both a road version and a rally version of the delicious ‘Sport Quattro SWB’ at a car show. “Dear Santa, I have been a good boy. There is just one thing I would like…” Joking aside, it was nice to meet my dream car in person. I think we all have one, or used to, at one time. I have included a short video clip of an Audi in action during the golden years of rally, when men were men and tyres were cheap. It should have been me in that video…if it hadn’t been for those meddling kids!